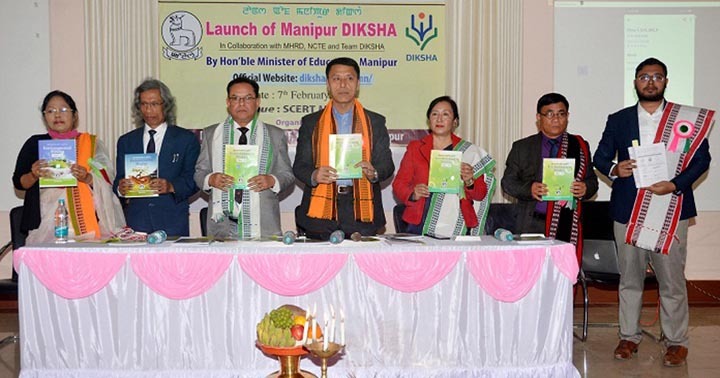 Manipur Education minister Thokchom Radheshyam on Thursday launched the official website (https://diksha.gov.in/mn/ ) of Manipur – DIKSHA, a platform for digital infrastructure for knowledge sharing for the State. DIKSHA serves as the national digital infrastructure for teachers to enhance knowledge sharing for better teaching-learning materials. Speaking on the occasion, minister Radheshyam appealed to the teachers and concerned persons to give feedback on the weaknesses and strength of DIKSHA after using and getting well acquainted with the portal. It is important that new initiatives of the government in education sector such as DIKSHA portal, EDUSAT are used by the teachers and people concerned to improve the teaching learning process, he added. The minister observed that technology has become an essential part of life determining the growth and development of a society. He said that implementation of DIKSHA in the State will help in providing a common platform to share and gain more knowledge for both the teachers and students. Secretary (SCERT) M Yaiskul Meitei; director, Education (S) Thokchom Kirankumar; director(SCERT) Dr M Meenakumari Devi; Team DIKSHA, New Delhi Sarthak Sathapathy, teachers and concerned officials attended the programme. It was organised by the Directorate of State Council of Educational Research and Training (SCERT) in collaboration with the National Council for Teacher Education (NCTE) and Team DIKSHA, New Delhi at Multipurpose Hall, SCERT, Lamphel in Imphal. DIKSHA, a national digital platform for teachers which offer resources for teaching learning and professional development,according to reports, provides open modular and scalable technology that state governments and other organization can seamlessly integrate with their respective teacher-centric initiatives. Under this programme, school textbooks will be ‘energized’ with a QR Code at the beginning of each chapter. The QR Codes will be linked to digital content which can be accessed by scanning the DIKSHA Android App available on Google Play Store. This unique initiative links the physical world of textbooks to the digital world of enhanced learning. Manipur has energized 3rd, 4th and 5th class EVS textbooks for this academic year.